Dr. George Merryweathers 1851 “Tempest Prognosticator"
The author has graciously shared this material from his website with readers of the Victorian Web. nyone fortunate enough to have a copy of A Tonic to The Nation (1976) will already be familiar with the reference to the above on page 163 in the piece written by T.W. Hendrick, Production Manager for Cockade, called “The achievements of Cockade “; in it, he says, “But one of the most amusing exhibits in the Dome was the Tempest Prognosticator -- a full-scale model by Roger Hopkin from reference to an ancient print. This elaborate and highly ornate apparatus was evolved by a certain Dr. Merryweather (no epigram intended) who had observed that during the period before the onset of a severe storm, fresh water leaches tended to become particularly agitated. The learned Doctor decided to harness the physical energy of these surprisingly hysterical aquatic bloodsuckers to operate an early warning system. On the circular base of his apparatus he installed glass jars, in each of which a leech was imprisoned and attached to a fine chain that led up to a miniature belfry -- from whence the tinkling tocsin would be sounded on the approach of a tempest." 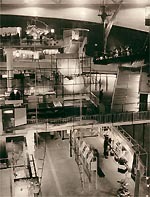 The model was displayed in the Dome of Discovery's 'Sky' gallery. As a result of my receiving a photocopy of the Treasury minute of 29th January, 1952 which confirmed the value of gifts of “certain scientific and artistic material ...presented to National Museums and other public institutions", I then made contact with Whitby Museum, North Yorkshire who received £150 worth of scientific material originally displayed in the Dome of Discovery at Londons South Bank Exhibition, as part of the 1951 Festival of Britain. The scientific material was the Doctor's machine! Right: “How the Tempest Prognosticator worked, with increasing atmospheric pressure, the leech touches the whalebone button and so causes the hammer to ring the bell." -- The Illustrated London News Exhibition Number, May 26th 1951. Early in the year the model of Dr. George Merryweathers “Tempest Prognosticator" of 1851 was received, as had been hoped from the authorities in charge of the disposal of exhibits in the Dome of Discovery of 1951. Its transport cost the Society ten guineas and making a table for its proper display added another seventeen pounds to the expenses of the year. But the interest taken in it by visitors and the care with which its descriptive label has been read, show what a valuable addition to its exhibits the Museum has gained. In arranging for its display, we have had very useful help from the Whitby Urban Council, who have afforded space in a corridor at Stone House for the temporary housing of one of the Museums ship models." With his thoughts directed to the workings of animal instinct, our Museum Curator had observed the peculiar sensitiveness of the medicinal leech to electrical conditions in the atmosphere; and this observation resulted in the invention of an apparatus which he described as “An Atmospheric Electromagnetic Telegraph, conducted by Animal Instinct," but which he decided to call the “Tempest Prognosticator.”. 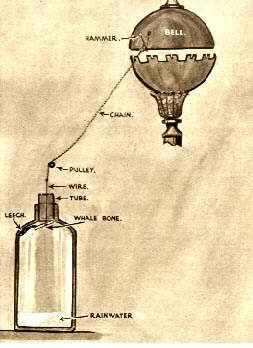 After having arranged this mouse trap contrivance, into each bottle was poured rain water, to the height of an inch and a half; and a leech placed in every bottle, which was to be its future residence; and when influenced by the electromagnetic state of the atmosphere a number of leeches ascended into the tubes; in doing which they dislodged the whalebone and caused the bell to ring. 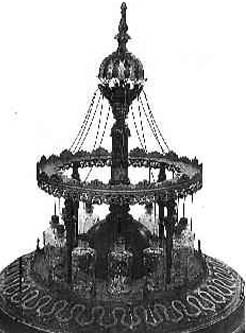 The design of the “Tempest Prognosticator" was, like Paxtons Crystal Palace, adapted from that of an Indian Temple, and the apparatus was put together by a few clever Whitby artisans. In his essay the designer explains that the twelve bottles were placed in a circle in order that his little comrades might see one another and not endure the affliction of solitary confinement. He had, he further told his audience, drawn six designs, from No. 1, the least expensive to No. 6 “now in the Crystal Palace, the most expensive, and adapted for any drawing-room. The simpler designs he looked forward to seeing used by the Government and the Shipping Interests of the country in stations all round the coasts, each having a Tempest Prognosticator and lifeboats under suitable and responsible officers, with an Inspector of Stations in general charge. Ultimately, he hoped, our Whitby pigmy Temples would be distributed all over the world. - “Mr. President and Gentlemen, you will perceive that I am ambitious. Dr. George Merryweather, of Whitby, was certainly an optimist. That any of the six available designs were adopted for practical use is unknown, nor is there a record of what happened to the original Tempest Prognosticator after it had been displayed by request at the rooms of the Society of Arts when the 1851 Great Exhibition came to a triumphant end. But its invention marked an early stage in Meteorological Science; and when, in 1950, plans were being made for a selection of exhibits in the Dome of Discovery that was to be one of the main features of the “Festival of Britain 1951", inquiry was made by the Design Research Unit for information as to the Whitby doctor, and his discovery. In correspondence with the Museum, the promise was made by the Design Research Unit of a recommendation that, on the close of the Festival, the 1951 model should come to Whitby. Now with the consent of Parliament, it has been given to Whitby Philosophical Society for preservation in the building that is the successor of the Museum of which Dr. George Merryweather was honorary Curator from 1840 to 1843 and from 1847 to 1861. The Societys committee has had constructed a suitable table for the model which measures three feet in diameter and is three feet six in height, and is enclosed in a plate-glass cylindrical showcase.."
A Tonic to the Nation. Thames & Hudson, 1976. The Illustrated London News Exhibition Number, May 26th 1951.